When it comes to saving money, shopping for clothes is my biggest weakness. My husband tells me every month "no spending"! I know what he means by this... Don't buy anything that you don't need. Well... I need clothes. I've gone about 2 months with out buying anything new. Okay... well maybe I bought one or two things here or there, but it wasn't much. I bought a sweater at Target that was on clearance for $5 and a pair of boots at Target that were purchased with a gift card from Christmas, so really it has been a while. I've been feeling like it was time to spend just a little bit of money on a few new items to add to my closet. So the other day I stopped at Kohls where they had a ton of clearance sales. I wasn't really looking for anything in particular, but I had an idea of some items I've been wanting, one being some bright colored pants. 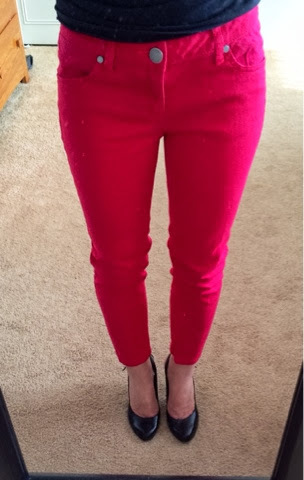 I lucked out, because sitting on the end of the rack were a pair of red cropped jeans in my size for $5. I knew I had to try them on. I've been wanting a new pair of colored pants for a while now, but I wasn't willing to spend a lot of money on them. I knew I couldn't pass up $5. 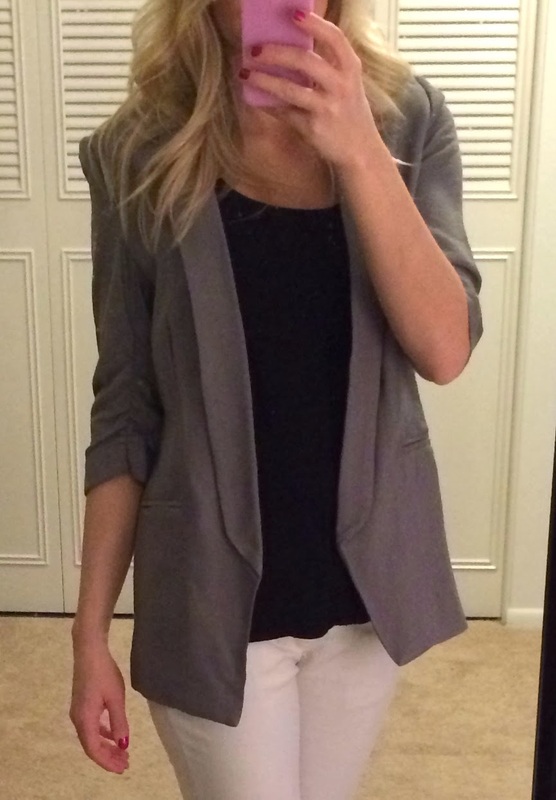 Along with my pants I also bought a grey LC Lauren Conrad blazer. The blazer wasn't as exciting of a deal as the pants. It was $14. Still, $14 is not bad at all, especially when it's originally $70. I love blazers, so I feel I can never go wrong with a new one. I also bought a pearl necklace for $4. I really wanted a chunky pearl necklace, but the one I found was $10. Even though $10 may not seem like a lot, it can add up, so I decided to get the peals that were only $4. In the end, I walked out of the store with 3 items all for the price of $24.38. My receipt said TOTAL SAVED: $117.00. This is why I never pay full price for anything! Why pay more when you can get the same thing for less?